I’d like to have a clear and concise explanation ready for friends and family that wonder why I don’t attend church any longer. I’d like to explain that it’s not all about being wounded by church-folk. I’d like to explain that it’s not about my rebellious streak. I’d like to explain that it’s not some kind of narcissistic bent toward self-fulfillment and a rejection of sacrifice. I’d like to explain that it’s not about rejecting the tenets of Christianity. I’d like to explain that it’s not about rejecting Jesus. I’d like to explain that it IS about a rejection of idolatry. The more I’ve prayed—studied—discussed the more I’ve come to understand that God is power, truth, and love. Power, Truth, and Love—where these things are present God is involved. Okay, so if my faith is weak, what faith are we talking about? My faith in the sovereignty of God is strong. My faith in the sacrifice and teaching of Jesus Christ is strong. My faith in the value of community is strong. My faith in the expression of love via service, kindness, respect, and loyalty is strong. However, I have no faith in the belief system we’ve constructed—zero—zilch—null—nada. The set of beliefs and practices we’ve all come to know as Christianity are just that – a set of beliefs. Our belief systems are NOT God. They attempt to explain and promote God, but they are NOT God. The Christianity that I reject is the one that worships the belief system. The Christianity that I embrace is the one that promotes a real relationship with an enigmatic creator as expressed through the Father, Son, and Holy Spirit. This real relationship is NOT expressed through church attendance, tithing, and/or Bible study. That is not to say that these things are bad or void of value, but they are NOT how I experience relationship with my enigmatic creator. Idolatry—to honor or revere anything in place of God. By my definition to honor or revere Christianity, scripture, values, beliefs, etc. constitutes idolatry the same as those nutty Jews that created a golden calf to worship while Moses was up top receiving the commandments from God. Is it really that far-fetched to consider the possibility that the absence of power and imminent decline of mainstream Christianity in America could be due to our worship of Christianity (religion) in place of a real relationship with God? Congregational expressions of faith in a brick and mortar church building can be a gas pump where we fuel up. But what we’re after is the fuel—the power—the truth—the love. The problem is that the most ardent defenders of religious Christianity are those that honor and revere the pump instead of the fuel it delivers. I’ve found a pond of fuel in a field and I’ve sold everything I own in order to buy that field (Matt 13:44). I’d like to have a clear and concise explanation ready for friends and family that wonder why I don’t attend church any longer. I’d like to be able to explain that I’ve sifted through my beliefs and pinpointed the things that show signs of power, truth, and love. I’d like to be able to explain that these are the only beliefs that I honor or revere, but I refuse to honor or revere them in place of an enigmatic creator. I’d like to be understood and accepted even though my perspective is challenging, dynamic, and fluid. I’d like to be able to articulate what it means to me to follow Christ as opposed to selling Christianity. But I’ve become keenly aware that my inability to communicate these experiences via a nice neat package shows signs of the very enigmatic creator that I profess to follow. 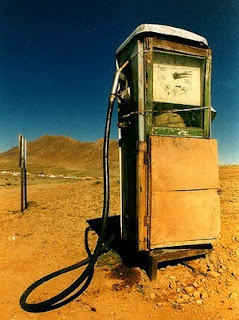 I’ve discovered that gas pump Christians never travel far from their gas station even when the pump has run dry. I pity them. I truly do.